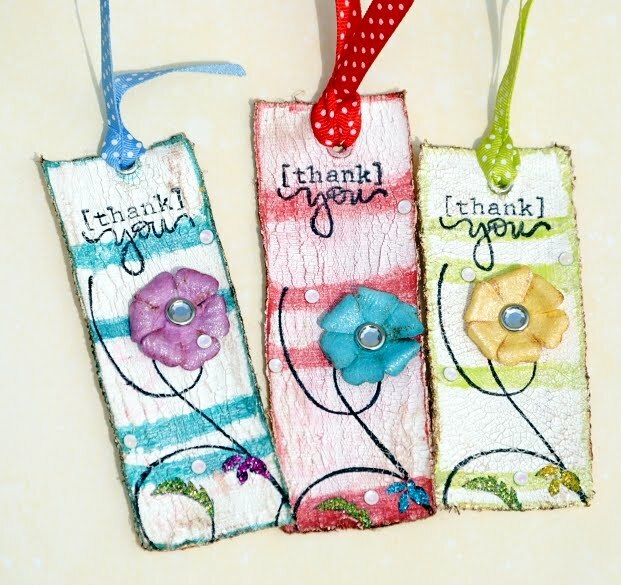 I got the clothing labels (those attached to new dresses) and I used them to make some "Thanksgiving tags". First, I covered the labels with Distress Crackle Paint (Picket Fence - by Ranger). 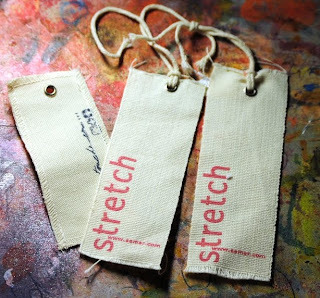 Then I used the Shimmerz to create the horizontal lines and to color the edges of the tags. The tags colors are: Fire Engine Red , Aqua Marine and Key Lime Shimmerz. 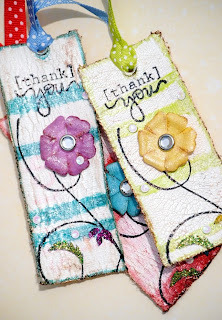 I stamped one black swirl on the "new" background, on which I applied a Petaloo flower. I colored the white original flower with Tickle-Met-Turquoise, Sunny and Sugar Plum Shimmerz. I hope I give you a nice idea to recycle your labels. Lovely! What a special way to thank someone. Love this....I so need to make several of these...but where can I find the tags? the effects here are awesome!! 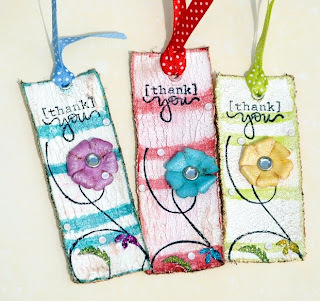 This fabric tags are so elegant and vibrant!